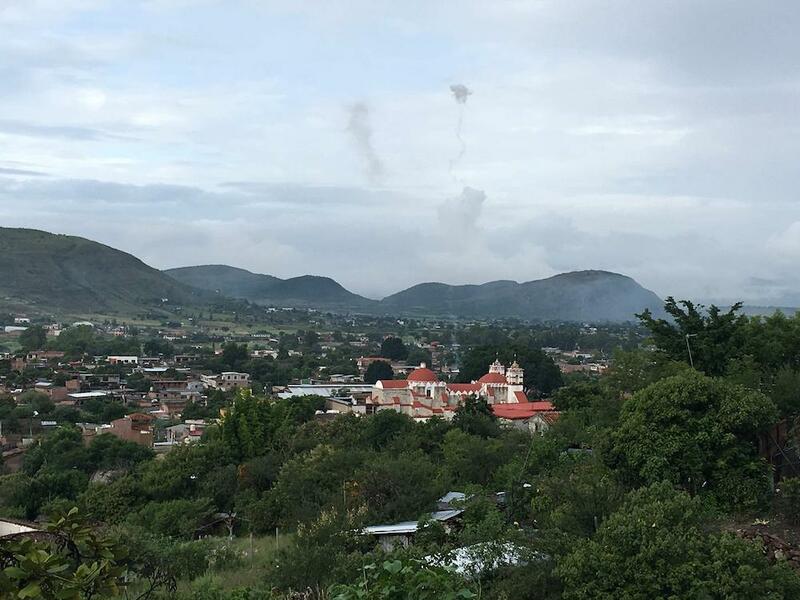 In the foothills of southern Mexico’s Sierra Juárez mountains, a tradition has kept a community alive for generations. The Zapotec weavers of Teotitlán del Valle, a village of about 6,500 people just outside of the city now known as Oaxaca, have been crafting their unique woven rugs and other textiles for centuries. One weaver, Porfirio Gutierrez, has returned to his ancestral home to find that these ancient skills are in danger. He is now defending this tradition against the same market and cultural forces that lured him away as a young man more than two decades earlier. 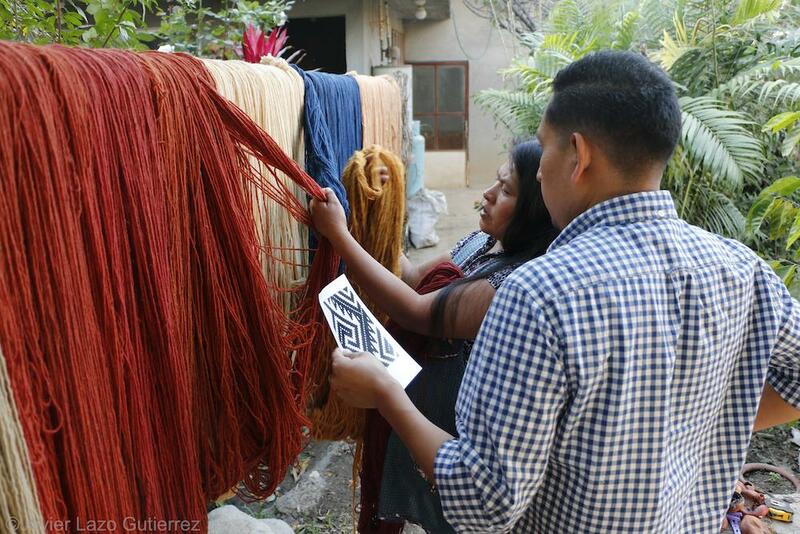 Porfirio Gutierrez weaves a textile with a traditional Zapotec design using a nine-thread-count-per-inch comb loom. The Zapotec weavings of Teotitlán del Valle have been treasured near and far. At least 500 years ago, the Aztecs exacted tribute from this community in the form of elaborate plant fiber textiles. Originally the textiles were woven with various plant fibers using “backstrap” looms, which are tied to a wall on one end and extend around the back of the weaver on the other. Yet after the Spanish conquest, the invaders introduced wool and freestanding looms. Traditionally, most fibers, both plant and animal, were dyed with a variety of natural dyes made from plants and insects. By the early 20th century, chemical dyes prevailed. They were easier to use and created colors that were more vibrant. However, chemicals used in the textile industry can contain toxic substances such as arsenic, lead and mercury, and they can have detrimental impacts on the environment, including polluting water sources. Textile wastewater can include not only the dyes but also other pollutants, including organics, nutrients, salts, sulfur compounds and toxicants. These wastewaters enter the environment as runoff after the dying process. By the 1970s, as the global economy reached Teotitlán del Valle, the village’s weavers began creating hand-woven rugs primarily sold through intermediaries to the North American market. 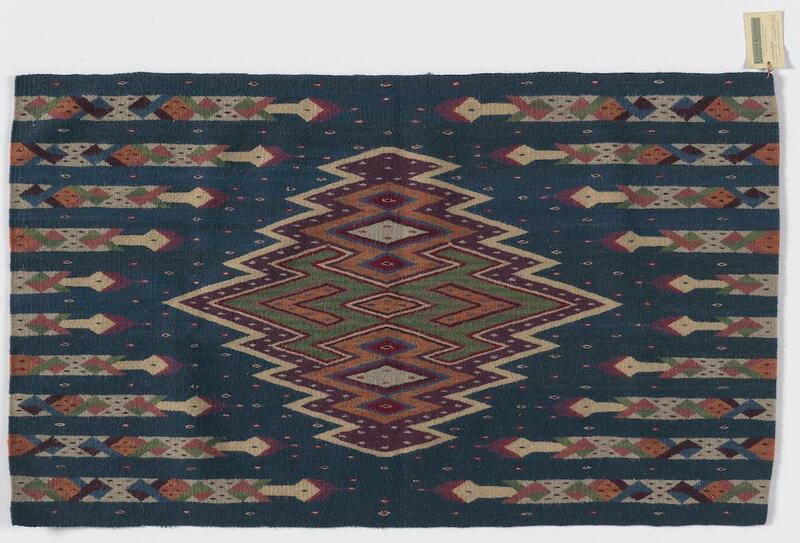 These wool rugs were often tailored to American tastes, evoking styles of the Southwest by using traditional Zapotec or Navajo designs. These textiles were colored almost entirely with chemical dyes. Gutierrez grew up in Teotitlán del Valle, where textile weaving occupied almost every member of the community – including most members of his family. 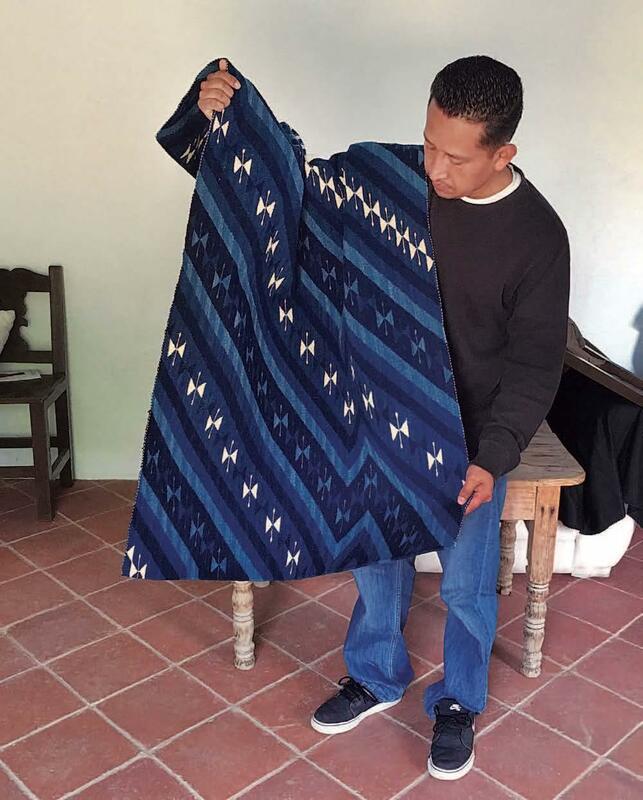 He learned to weave when he was a 12-year-old child but readily admits that he harbored no passion for it or other Zapotec cultural traditions. “I was never aware of what I was part of until I left,” he says. Like many local youngsters, he had been bombarded by Western media, colonial history and contemporary Mexican culture. He was given the impression that his Indigenous culture was stagnant and that prosperity could not emerge from tradition. The allure of economic prosperity induced Gutierrez to look for employment in the United States. In 1997, the then 18-year-old Gutierrez moved to Ventura, Calif., where he worked in a cement factory and as a restaurant manager. He would go on to start his own family and didn’t look back for almost 10 years. When Gutierrez did finally return to his home village to visit his relatives in 2006, he discovered he had a new appreciation for his Zapotec culture – its language, dance, music, food, ceremonies and especially its weaving artistry. In his absence his sister, Juana, who is nine years older, had been learning the practice from their parents and other community elders and reviving the village’s natural dying techniques. She was even conducting her own dying experiments with new plants to increase the range of natural colors used on both wool and plant fibers. All of this work inspired Gutierrez to resume the family trade in an attempt to revive the traditional Zapotec methods of weaving. Although Gutierrez’s father and sister were excellent weavers, neither had attended school and both lacked the means to promote the family’s work. Ironically, it was Gutierrez’s understanding of economics and international markets and his fluency in English – all of which he acquired in the United States – that enabled him and his family to take over their own artistic and economic destiny. “We came together, Juana’s family, our parents and a few of our siblings and decided that our legacy must survive and it was absolutely important for the young generations in our community to know that there is something much more important than money.” In 2007 they gradually started setting up their home as Porfirio Gutierrez y Familia Studio and promoting it as a place where people could visit and see how the wool was spun, died naturally and woven into finished textiles. Perhaps most importantly they were selling their work directly to consumers. They no longer were at the mercy of the intermediaries; they could express themselves through their art. The studio now employs 21 of Gutierrez’s relatives, who produce a variety of traditional weavings and new designs, all with natural dyes. 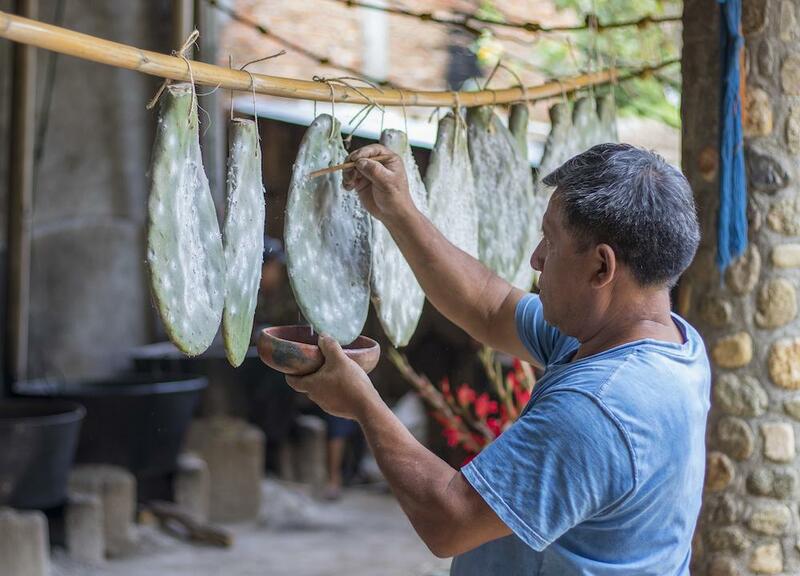 Visitors can watch as he and his family work as a team to craft the textiles by hand. 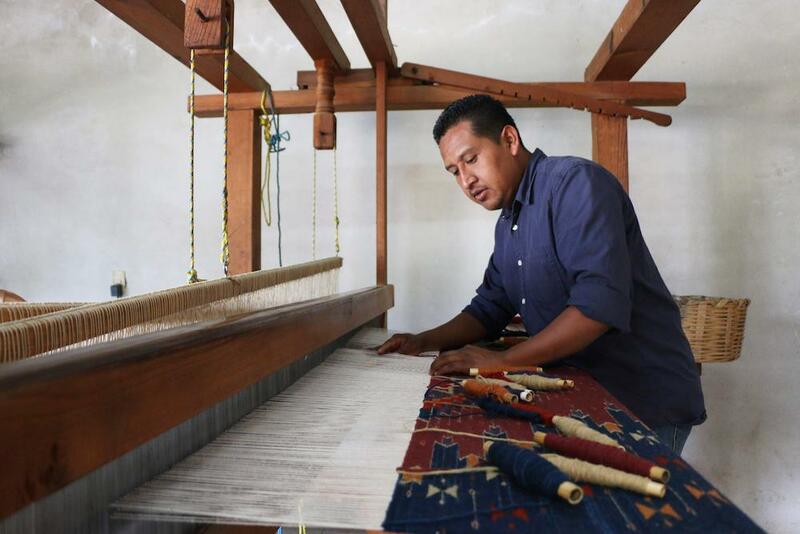 Each worker is skilled in a specific task that is integral to weaving and rug making. Juana does all the dyeing. 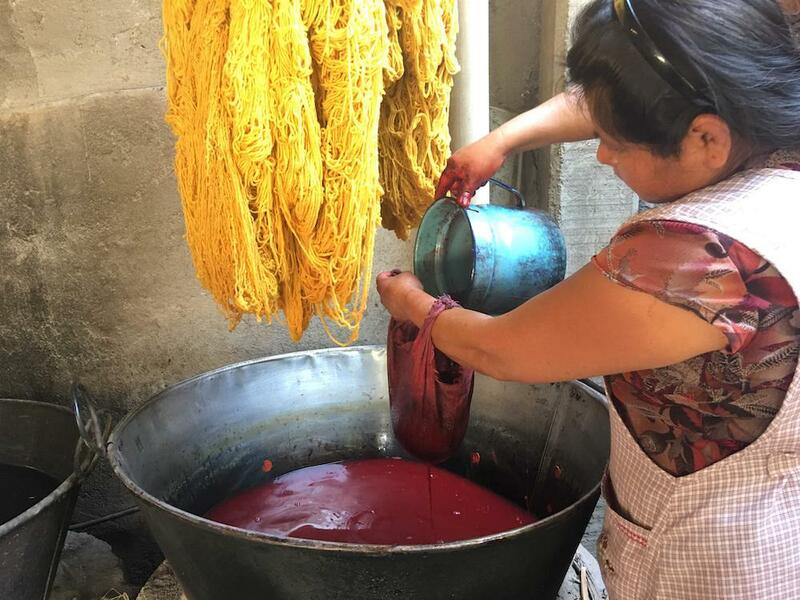 She has created more than 200 distinct colors from natural dyes, but the dyes themselves require considerable labor. Many colors come from seasonal wild plants such as pericon (Mexican marigold) or fruits such as pomegranate and sapote, which must be gathered from the countryside every year. Once that supply is exhausted, it cannot be replenished, and there might not be more until the plants can be harvested again the following year. Just like her ancestors, in order to get rich red and crimson hues, Juana uses the parasitic cochineal insects that feed on prickly pear cacti. 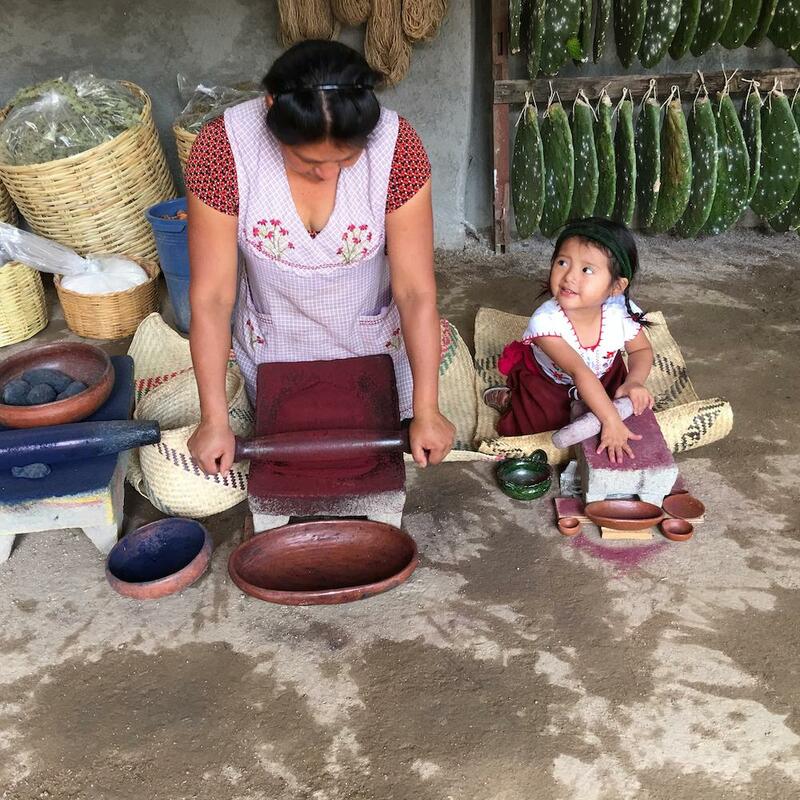 The cacti are harvested and the cochineal is then removed, dried and ground on a metate – a slightly concave stone – into a fine powder that Juana can combine with water and mineral salts to create the dyes. Other family members might do less-technical designs, gather materials and groom pieces depending on their availability. Gutierrez as well as his brother, brother-in-law and nephew take care of some of the most technical designs and weaving, but he stresses that the individual skills of the entire family are integral to the creation of each piece. “My niece who finishes, who tucks in all the ends of my pieces, who takes a needle and tucks back the fringes, that is an art in itself. … You have to keep the tension correctly to make it so when you look at the piece, you don’t know the fringes were ever there.” Because each piece of weaving takes so much time to create from scratch, many members of the family are needed to contribute to the project. Justin Mugits is a program assistant in Learning and Museum Programs at NMAI. He has previously worked as an archeological technician, baked bagels and served in the Peace Corps as an English teacher in Mongolia.